A Guidance Line of Credit and a Master Installment Purchase Agreement can simplify and expedite the acquisition of capital assets for your municipality. A Guidance Line of Credit is a pre-approved credit approval from a lender, for a municipality’s capital projects for a period of time, which is typically twelve months. First, each department head submits its funding request to the chief administrator for approval. Next, the lender and the administrator review the expected borrowing needs to determine the size of the guidance line. Finally, a contingency is added to cover unexpected capital expenditures that may arise throughout the year. 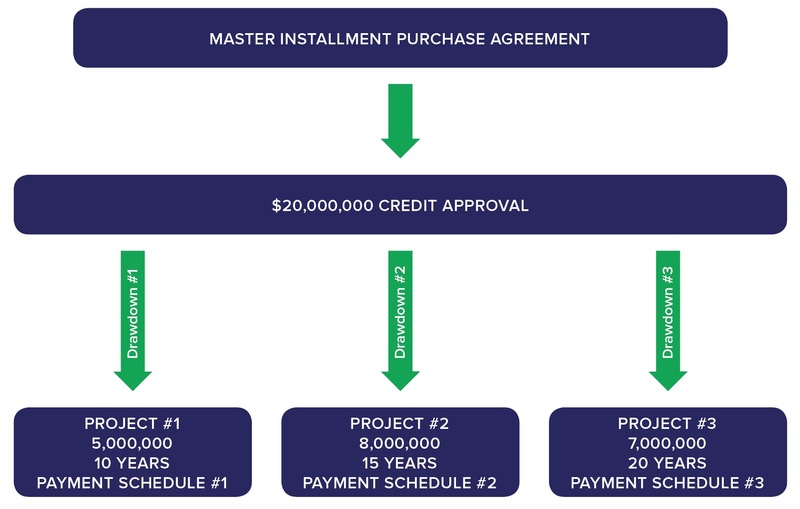 The Master Installment Purchase Agreement (MIPA) outlines the terms and conditions between the municipality and the lender, which includes insurance, debt service requirements, asset maintenance, purchase option, etc. Next the MIPA is submitted to the governing body for approval. Once approved, the municipality can commence drawdown request throughout the year to acquire a wide variety of assets. Since the MIPA was pre-approved by legal, the municipality can respond more quickly and efficiently to department funding request, which saves money. Frequently, the governing body grants authority to its top administrator and/or a delegate to execute future drawdown request. Although the Guidance Line of Credit is established, no interest will be accrued by the municipality until a line drawdown occurs and a payment schedule is signed by both the lender and the municipality. Each drawdown is treated as a separate transaction under the MIPA, with a distinct payment schedule, interest rate, and funding date. The interest rate will be established at the time of funding. Upon receiving and approving the municipality’s drawdown request, the lender funds the project escrow account, which is also managed by the lender. Once the asset is delivered to and accepted by the municipality, the vendor submits an invoice to the municipality for approval, which are then forwarded onto the escrow agent/lender for payment from the project fund. The entire process takes a few days instead of months. In conclusion, a Guidance Line of Credit and a Master Installment Purchase Agreement are valuable tools to conveniently and effectively fund your equipment, infrastructure, energy, and facility projects. It allows you to organize your project financings under a single program to reduce paperwork, improve productivity, and lower cost. Sign up for our email list to receive news about articles we are featured in and white papers bringing new information to the public.